Mirka Knaster  has done the Buddhist world a great service with her inspiring spiritual portrait of Anāgārika Munindra (1915-2003), the endearing, indefatigable Bengali Buddhist teacher who (along with Ajahn Chah, S.N. Goenka, Mahāsi Sayādaw, and Sayagi U Ba Khin) was key to the transmission of vipassanā to the West. Munindra had a profound influence on the first and second generation of American-born Buddhist teachers including Joseph Goldstein, Jack Kornfield, Sharon Salzberg, Larry Rosenberg, Marcia Rose, Sharda Rogell, Kamala Masters, Ruth Denison, Sylvia Boorstein, Michael Liebenson Grady, Christopher Titmuss, James Baraz and Lama Surya Das, as well as on psychologists like Jack Engler and Daniel Goleman. Ms. Knaster divides her book into chapters which examine how Munindra personified sixteen positive Buddhist mental factors (e.g., mindfulness, generosity, loving-kindness, compassion, determination, joy, equanimity) in the way he conducted his life and in his relationships with others. Ms. Knaster contacted close to two hundred sources who knew Munindra, and visited his family and the places where he had lived in order to gather the material for this volume. The result is a book that can stand alongside David Chadwick’s Crooked Cucumber (a biography of Shunryu Suzuki Roshi) in both illuminating American Buddhist history and demonstrating what it means to live a life fully in accordance with the Dharma. 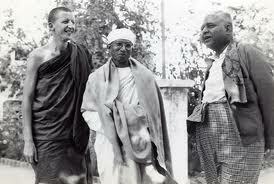 Munindra, like Suzuki, never wrote his teachings down; they live on through the loving efforts of their students. The impetus for the book arose while Ms. Knaster was in the midst of meditating at the Forest Refuge in Barre, Massachusetts and the question “Who is honoring Munindra-ji’s life and legacy in the Dhamma?” arose spontaneously in her mind. This is a truly marvelous book that brings Munindra-ji to life with hundreds of touching, edifying, and, at times, amusing anecdotes. Munindra denied being enlightened, but he lived an enlightened life. 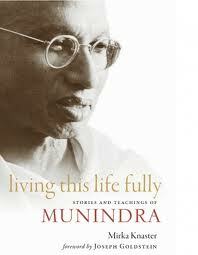 Unlike teachers who were imposing and unapproachable authorities, Munindra seemed quite ordinary (in an extraordinary way!) and exemplified the role of kalyāṇamitta (spiritual friend) that many Western teachers aspire to today. He was a master of the Pali Canon, and lived, breathed, and spoke the holy life 24/7, but he met students where they were in a gentle, nonjudgmental way, and encouraged them to “Keep it Simple. Be light.” He approached everything with inexhaustible joy and curiosity, lived simply, and was tireless on behalf of others. His own unstinting, single-minded efforts to overcome obstacles in order to learn the Dharma and bring it back to India are awe-inspiring. His endurance of pain in learning to meditate, and his perseverance in overturning the Burmese military’s refusal to allow him to bring his Dharma library back to India are cases in point. More important is his example that one doesn’t have to emulate anyone else or play-act a sanctimonious role to be holy — one just needs to develop one’s own self, just as it is, through continued, devoted, and sincere practice. Munindra didn’t want to be a lay person, but he also didn’t want to be a monk, so he re-invented the role of anāgārika, the homeless life, for the twentieth century. One of my favorite anecdotes comes from psychiatrist and meditation teacher Paul Choi, describing his first and only meeting with Munindra. He had come to Calcutta as a tourist with little idea of who Munindra was and equally little interest in spending time with him, but a mutual friend had given Choi presents to deliver to Munindra while in the city, so he dropped by Munindra’s family’s home. That was how Munindra treated everyone, even strangers, the poor, the sick, and the unbalanced. And that was the effect he had on everyone. It is also the effect he will have on you if you have the good fortune to read Mirka Knaster’s luminous tribute to an authentic modern Bodhisattva.